Naturally enhance you youthful beauty! Dr. Murphree is Qualified by the Virginia Board of Medicine to practice Medical Acupuncture in the Commonweath since 1999. 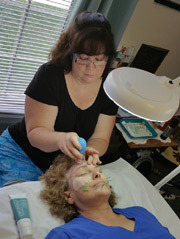 Her Facial Rejuvenation Acupuncture training was with Michelle Gellis, 1 of 3 in the country to train FRA. Fertility IVF Acupuncture, and radiating back pain like-sciatica are acupuncture common treatments at the clinic. Testing meridians with the Ryodoraku Machine allows me to measure meridians even within themselves which cannot be done with pulse diagnosis. These points are derived from Japanese and Chinese Oriental Medicine. The combination allows me to work closer and more accurately to find the problems. Intention is the Reiki key to great acupuncture. Currently, the World Health Organization recognizes over 200 conditions treated by acupuncture. Call Fairfax Chiropractic today at (703) 279-2101 to schedule an appointment to learn more regarding how acupuncture may help you. Acupuncture has been used for thousands of years with great results. Using disposable silver needles, and cupping techniques, Dr. Murphree will try to balance the body’s meridians. Like chiropractic, one of the key advantages of acupuncture is that the side effects are largely positive effects! Acupuncture has been used with IVF and has been a topic in the press lately, stating that acupuncture on the day of IVF may increase pregnancy success rates to 39% up from 26% with IVF alone as summarized out of the May 2006 medical journal, Fertility and Sterility, Vol 85, Issue 5, pp 1341-1346. Also, in October 2004, the American Society for Reproductive Medicine confirmed the value of the two services combined with a 51% pregnancy rate to that of 36%. It also showed a promising lower miscarriage rate from 20% in the control group to only 8% in the acupuncture and IVF group. These studies demonstrate that acupuncture combined with IVF procedures may result in higher conception rates. More studies are needed, but the initial results, including the very first study in medical journals: Highlights in Fertility and Sterility (Vol.77, No. 4, April 2002) have made couples enthusiastic with the outcomes. Using disposable needles in the metals alloys of silver allow Dr. Murphree to sedate or tonify certain points in the body for IVF implantation to work by three different assumptions. One is the increased enhancement of blood flow to the pelvic region, another is optimizing endometrial receptivity, and finally, affecting gonadotropin secretion from the pituitary. Acupuncture and IVF, Lifang Liang, 2004, states that the combination of the two procedures has potential up to 31% success. Acupuncture seems to allow the IVF procedure to have a more effective environment in the pelvic region for success. 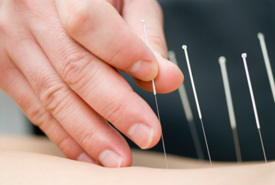 Most acupuncture needles before and during IVF are not painful. The disposable needles are up to 20 times smaller than an hypodermic needle. Detoxification vitamins and herbals for digestive, respiratory, and other organ systems may be helpful in the 3-4 month preparation of IVF. If necessary, these can be determined at the time of your visit. Dr. Elizabeth K. Murphree DC has been using Japanese developed sophisticated meridian graphing of her patients in Fairfax for acupuncture since the beginning of 1999. These printed, computerized graphs are easier to interpret and progress is evidence based rather than subjectively asking a patient if they feel better. Better information for treating pain is possible with this state-of-the-art technology. Patients can see their progress on these charts along with the doctor when the exam is performed about every 2nd – 3rd visit. Some commercial insurance companies will reimburse as long as documentation of the whole body meridian systems are addressed rather than just infertility issues. Most IVF acupuncture is performed in sessions of 6 visits with about a 30 minute visit obligation in time. Dr. Elizabeth K. Murphree DC incorporates the best of Chinese 5 element balancing and state-of-the-art Japanese computer Ryodoraku analysis. This “come together” approach of hers allows patients the opportunity to incorporate many symptoms in their visit. Most patients will address allergies, knee issues, and IVF protocols all on the same visit with her because she believes that the whole body works as one and will perform the necessary extra work a patient may need. Practicing Acupuncture for over 20 years, Dr. Murphree is able to read her patients. A talent that many acupuncturists fail to recruit. Intention is worth a lot with Reiki and with Acupuncture so it is stronger to have the patient connected and understanding rather than intimidated by a language barrier or an open treatment room. Dr. Murphree uses only private rooms for her treatments and you are encouraged to take your time.